Okay, so this technically isn’t a Halloween themed beauty product, but it’s spooky how quickly I fell in love with this scent, so I’m going to roll with that as close enough. I went to Sephora with my gal Sam the other day and she was checking out perfumes (which honestly aren’t usually my bit) and pointed out the one she was getting, Beachside, from the Replica line from Maison Margiela. Her choice was very beach-y (as is the goal of the Replica line), but it wasn’t quite my style. I checked out a couple of the others, and really fell for 2; Fireside and Jazz Club. I felt a bit weird about Jazz Club because the packaging says that it’s a male fragrance and I didn’t know if there were rules about that. Fun Fact: there aren’t. Wear what you like (I confirmed this fact with Sam and Becca, who was helping us). I went to the rollerball area because I’m not ready for a big perfume commitment and there sat Jazz Club. So guess what came home with me? Jazz Club. It’s $28 which I found a little difficult to part with for such a small amount, but since I don’t like overdoing scents, I use it sparingly, and figured it would be worth it. Jazz Club smells smokey and a little masculine but also deep and warm. It’s kind of like that feeling when you’re curled up with your favorite warm beverage and a great book; it’s very comforting. 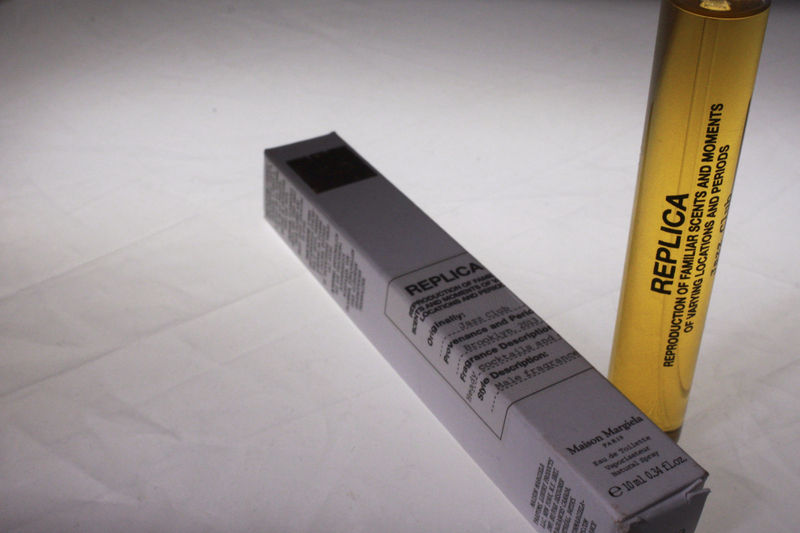 So I’ve been wearing it and loving it and I think if you’re someone who associates smells with feelings, you should check out the Replica line from Maison Margiela.